An effective security company needs quality security guards. Without a thoughtful screening process for potential candidates, there is no way to assure this quality. Without quality, there is no security. That it is why it is so important to have criteria that you can use to determine if a security guard is right for the job before you hire them. To get the best guards available you need a company that knows what to look for in their employees. Knowing where a security guard has worked up until this point is extremely valuable. This information can potentially give you insight on the surface level of their character. What did their previous employer trust them to do? If they worked as a security guard somewhere else, what reason may they have for leaving? These insights will not necessarily give you enough information to make a decision as to whether or not the candidate should be hired, but it should definitely shape your expectations and inform your interview strategy. It is always important to train security guards, but without an established work history, the only measure of job aptitude is some form of previous training. When a potential employee has received training prior to seeking employment, this can be extremely valuable. Firearms training from a military or law enforcement background ensures a level of competence that could be used for armed guard services. But this type of training may mean less if the employer is not looking for armed guards. Useful civilian training can be any high rank earned in martial arts. Though there are more practical forms of martial arts than others, years of extensive knowledge in any style can be a great background for future training. With any potential hire, it is important to understand how they view their current knowledge. Any type of unwillingness to admit gaps in their level of competency can demonstrate a likely difficulty in re-training. It is important that their previous training demonstrates some willingness to learn so that they can follow company guidelines. It should go without saying that all security guards must undergo thorough background checks, but many companies skip this step. In a background check, you are looking for potential red flags. Any history of drug addiction, beyond drug testing, should be investigated. Criminal history is by far the easiest information to get, and the most important. Knowing about a security guard’s past is an absolute necessity. This is a person that is being trusted to not only protect vulnerabilities, but they are also acting as a representative of the company. Their behavior reflects the choices of everyone that put them there. During testing, interviews, and training, it is important to be looking for the foundational personality traits of a security guard. Listening comprehension is one of the most important skills to test for. How well can they perform a task after it is described to them? Once you know that they can listen and understand their tasks, you need to know if they can think critically. When something unexpected happens, how do they respond, and how do they balance their response with company protocol? An ability to pick up skills on the fly is unbelievably useful, as clients may have certain needs or use unfamiliar technology. Security guards may need to pick up protocols for electronic locks and safety equipment with very little time for preparation. However, the most important trait for a security guard is expressive communication. They need to be able to articulate themselves to communicate an issue or what happened during an incident. But that goes hand in hand with situational awareness. A security guard must be able to constantly assess their surroundings to keep everyone safe and accurately report. 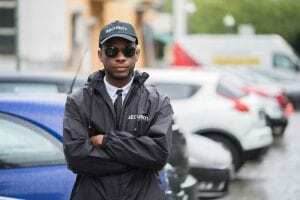 Due to the incredibly high turnover rates in the security guard industry, many companies are just looking to fill positions with warm bodies. But any security guard company worth their salt knows that the turnover makes it that much more important to screen security guards effectively. With so many people leaving and coming in, a failure to determine if a candidate is the right person for the job puts everyone at risk. It is important that the company gives itself enough time to vet their workers properly. A time crunch for filling a position must be anticipated within this field, so the screening process has to run like a well-oiled machine. It is important not to compromise on the effectiveness of the hiring process for the sake of time. Rather than take on work that cannot be done well, protect your customers and your brand by only using security guards you have had time to screen and train. To effectively screen security guards before you hire them, a company needs to take their time. They have to look into the work history and previous training that they may have received. Conduct thorough background checks and focus on potentially harmful behavior, and look for the type of personality that will thrive as a security guard. Make sure that the company you use is doing all they can to give you the best protection possible. Article submitted by Lock and Security Expert Ralph Goodman of United Locksmith. Visit him on his Blog, Twitter, and Facebook.